This holiday season, like every year, I bought a couple of gadgets. As always, they fall into 3 categories: gadgets I needed, gadgets I thought I needed, and gadgets that looked nice on the screen . You could probably get most of these gadgets for less in post-holidays sales, but I learned to look beyond seasonal prices. Laptop - By far the more expensive gadgets I bought were my new laptop and my new monitor, but those warranted separate posts. Remote controlled surge protector - covered in this post. 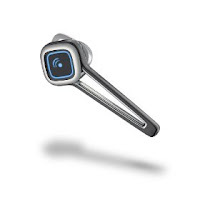 Bluetooth headphone - I've been suffering from from a string of bad headphones. They either did not process sound well, ran out of battery too soon, or were plain uncomfortable. The Plantronics Discovery 925 answered all my requests: it fits nicely in my ear (it has 3 sizes of eartips, and does not use an over-the-ear holder - an annoyance when you wear glasses), it allows you to talk for 5 hours, it comes with a nice leather case - that actually serves as a charger. Another feature I like is the ability to pair it with 2 phones. And it just looks nice, compared to the other headphones out there that make wearers look like transformers. About the only bad thing I can say about the headphone, is the fact that all functions (on, off, pair, pair again) are controlled by one big button. The function is selected by the length of time you hold the button - quite confusing. Still, after pairing it once, all you need to do is turn it on and off. Get it on Amazon, in one of 3 colors. Coffee maker - I'm not a coffee connoisseur or addict, but I like a good cup every once in a while. After seeing one such machine in our NY office, I decided to get a Keurig coffee maker. 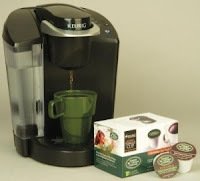 It takes a capsule (called "K-cup") with either coffee or tea, and generates one cup in a minute. I almost got the B30 model at Amazon, but then found out that the company is running a promotion in supermarkets, selling a newer model, bundled with 12 K-cups of your choice, for $79. This model is called the "Classic" or B44 (cannot be purchased online, the closest you can find is the B40. You can read more about that promotion here). So far, I tried and enjoyed the Espresso blend by Green Mountain (that supports fair trade) and "Midnight Magic" by Timothy's. Amazon runs a promotion where you can get double the amounts of cups for the same price (48 cups for $21), bringing the price of a coffee cup to less than $0.50 per cup - not bad. Phone - I needed an extra phone for emergencies - my Blackberry failed to find a network several times in Australia and Europe. I looked for the cheapest phone I could find that would be able to operate everywhere in the world, and that wouldn't commit me to another contract with a provider. 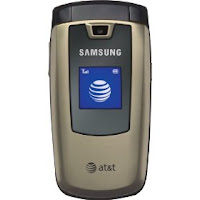 I settled on the AT&T Pay-as-you-Go plan, and selected a refurbished quad-band Samsung A437. It looks brand new, and has a camera, bluetooth and the rest of the required apps. It cost $50 and for $25 more I got 350 minutes. I also needed a USB cable, to charge it off my laptop, or USB plug. But rather than pay AT&T $29 for a cable, I picked it up at Amazon markets for $2.98. The consequences - why, oh why does every electronics vendor have to come up with his own USB plug (the answer - so they can charge $29 for a cable ). Because of all my gadgets, I now have to carry so many USB cables with me on the road. A quick count: a regular mini-USB for the Blackberry, a Samsung USB for my P2 media player, another different Samsung cable for my phone and another cable for the Plantronics from item 3. Add a USB wall plug and a car plug, and you end up with this mess: There is absolutely no justification for this. 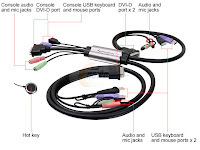 I've half a mind to start a petition: any vendor that comes up with a unique USB cable, without a good technological explanation, should be fined. Anyone in?